Brian Burke’s legacy with the Toronto Maple Leafs will be forever tied to one player he acquired via a major trade and it’s not the diminutive scoring sensation Phil Kessel, it is the new Leafs captain Dion Phaneuf. It’s hard to find anybody that didn’t like the trade (though Ian White outperformed Phaneuf last season) and if Keith Aullie (included in the deal) continues to progress into a top six defenseman it will look even better. When Burke named Phaneuf as his captain he also firmly tied his anchor to the hard hitting defenseman, for better or worse. 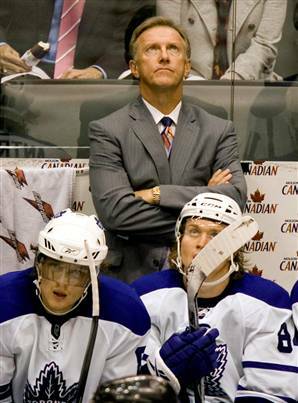 If Dion Phaneuf turns out to be a bust, or even slightly disappointing over the next two to three seasons in the blue and white I don’t think Brian Burke will be around much longer after that. The city of Toronto is a cruel one to the beloved boys of winter and will turn on you in a country minute if you fail to live up to expectations, even if you are captain and maybe especially if you are captain in Dion’s case. The list of failed (in the fan’s eyes) players is a long and in some cases illustrious one and who will ever forget Larry Murphy being booed out of town, or Bryan McCabe. Ahh Brian McCabe, the scary part for me is if you squint your eyes just slightly while watching your television set and watch #3 Dion Phaneuf on the ice, you almost see a little #24 (McCabe) in him don’t you? They almost look similar with their receding spiky haircuts, they both skate a little awkwardly and handle the puck like a grenade at times (does the puck not just seem to bounce on Dion’s stick more than other players?) but both also possess very solid hockey skills with booming shots and a physical edge. While one is being celebrated and touted as a potential franchise saviour with little to no success in his short reign the other was essentially given the boot even after scoring 83 goals, 297 points and was a plus +63 in 7 seasons and 523 games. It has to be pointed out that we are comparing the first five years of a defenseman’s career in Dion Phaneuf and more of the middle aged years for McCabe but I think this does show us that the comparison might have some merit. Phaneuf has been a model of health over his first five pretty successful seasons while McCabe has definitely started to show his age with more than a few injuries mixed in over the years but again this is just to make a comparison. One player was vilified and one of the most hated players at the end of his Leafs career while the other has been celebrated as one of the best defenseman in hockey, something just doesn’t add up in this equation. Bryan McCabe was not without his weaknesses (thank you captain obvious) but this is also a man who once scored 19 goals and tallied 68 points in only 73 games in 2005/06. I don’t think I am going out on a limb when I say that Dion Phaneuf is a tad overrated. In the super scientific poll conducted by Sports Illustrated, a player poll ranked him as the Most Overrated Player in the NHL. The magazine asked 272 players in the league to name the player whose reputation exceeds their performance. Phaneuf ran away with the title, capturing 21 per cent of the vote, next was the Rangers’ Wade Redden with 7 per cent followed by Montreal’s Scott Gomez with 6 per cent. Based on the early returns during Phaneuf extremely limited tenure I can see where some of this noise is coming from. However I also see a talented and physically dominating player who can hopefully turn his game around and lead the blue and white on the backend for more than a few years. Not many will argue against the trade that brought the future captain to the Leafs and I won’t either but that doesn’t mean that a team using a player like Phaneuf as one of its building blocks isn’t playing with just a bit of fire, especially in this market, just ask Bryan McCabe. What are your expectations for Dion Phaneuf? WOULD LEAFS CONSIDER SHELDON SOURAY VIA RE-ENTRY WAIVERS? If the above situation came to fruition and the Edmonton Oilers bit the bullet and put Sheldon Souray on waivers (with no takers) and then placed him on re-entry waivers would the Maple Leafs bite at a half priced Souray (approx 2.7 million hit)? I know what you are thinking and the Leafs clearly have a glutton of defensemen but at least here me out. Souray when healthy is a step up offensively over all of our defenseman (including Phaneuf) and has been a beast on the power play over his career. In his past two full healthy seasons (2006/07) Souray tallied 26 goals and 64 points with 19 coming on the power play and in 2008/09 he notched 23 goals with 12 via the man advantage. Obviously not a terrific defensive or all-around player the Leafs could risk this and allow him to build up some trade value while simultaneously helping their horrific power play (he would be a HUGE step up on Tomas Kaberle) and possibly trading him when a team desperate for some backend help comes calling at likely only a prorated portion of his 2.7 million cap hit if moved around the trade deadline. Or they could keep him if he shows an improved game as Tomas Kaberle’s cheaper replacement and be able to move Kaberle and a Francois Beauchemin (or Mike Komisarek) if the right deals were presented. Somebody more familiar with the CBA and salary cap ramifications could enlighten me if the Leafs would be able to first trade Souray and would the team acquiring him only be on the hook for his re-entry waivers price tag and cap hit? Not sure what Brian Burke would think of something like this but I am confident he has at the very least pondered such a scenario. Give Kadri time to develop, he'll be just fine. With Leafs nation all abuzz with the pending preseason cuts and who will and won’t make the club out training camp I wanted to take this time to discuss Nazem Kadri again and basically to say, give the kid a break. I am not going to feel sorry for him (or any pro athlete) as this is the life they chose and it is filled with amazing perks, monetary compensation and unfortunately in Toronto, a bit of additional pressure for a city starving for a hockey winner but I also feel it is time for a little perspective. We have to face facts that while we wish he was ready for big league action and our supposed 2nd line centre but reality is Nazem Kadri is still a kid, literally. Kadri was raised in a big Arabic household in a tight family oriented environment and as a male being raised in such a situation (coupled with the fact he was a minor hockey star at a young age) he was likely treated like a king from birth all the way through until now. Kadri is more of a kid that a lot of ‘kids’ his age, and I feel he will just take a bit longer to develop both mentally and physically, but the gifts and sheer talent he has been bestowed by the hockey gods are undeniably great. Like a lot of kids who don’t leave the nest prior to turning 20 years old I doubt Nazem has experienced much in the way of real life experience or hardship and is still very much reliant on his parents for support, both emotionally and mentally. Kadri is still a kid adjusting to a very different (and hectic) lifestyle and is also likely away from home for the first time in his life. He just added approximately 15 lbs of muscle to a very slight frame and likely put his body through an unaccustomed workout regimen that has left him looking slightly slower and less explosive. If Nazem Kadri were a baseball player (say Kyle Drabek) he would barely be above ‘A’ ball at this point in his career and there would be zero expectations for an immediate and drastic impact in his first year out of junior hockey. Tyler Bozak was a rookie for the Leafs in 2009/10 (at the age of 24) and he showed a lot of improvement during the course of the season last year but there were still some things lacking overall from his game early in the year, and he has four years on Nazem, think about that. Kadri has most of the necessary ingredients to be a solid professional, just needs the time for them to properly simmer and cook. Only the rarest of rare talents can step out of junior hockey as a boy and play a big time role in a man’s game, although I think we erred when Luke Schenn was not sent back to junior after being drafted 7th overall by the Leafs in 2008, Schenn unlike Kadri was basically a boy in a man’s body. For every Patrick Kane, Sidney Crosby and Steven Stamkos there are countless others that are just not ready to step immediately into the world of professional hockey at the NHL level. Brian Burke will bring Nazem Kadri into his office and explain to him that the Maple Leafs are happy with his progress thus far, he is coming off an exemplary junior career and he should try his hardest to ignore the harsh media onslaught and go to the AHL with his head held high. Work on improving the weakest facets of his game and get accustomed to playing against men and make the necessary adjustments as needed. We’ll continue to monitor you closely and you are only a step or two away from returning to the big club but don’t worry about things you can’t control, just focus on playing hockey, a game you love. 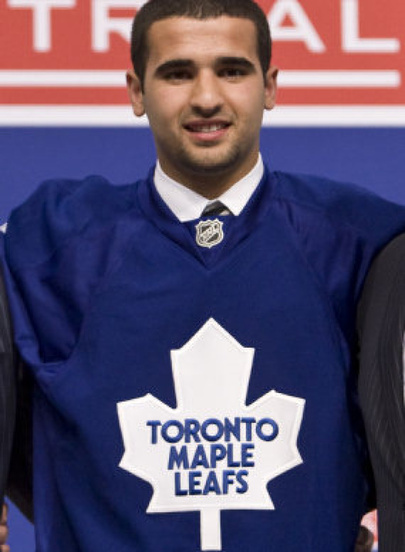 Folks, Nazem Kadri is a fine young prospect I am hopeful that a bright and promising future lay ahead as a #2 playmaking/sparkplug centre but as Axl Rose said (or sang), what we all need right now is “just a little patience”. Tim Brent has made noise in training camp for the Leafs in 2010 and the 26 year old is apparently leading the race for the wide open 3rd line checking line centre role. Brent signed with the Leafs in 2009 and played 33 games for the Toronto Marlies (13 goals, 15 assists in 33 games) and is known as a responsible defensive centre that can win some draws and chip in on the penalty kill. A career minor leaguer since 2008/09 spanning 97 games Brent (6’0”, 200 lbs) has managed 33 goals and 57 assists, scoring at a 0.92 point per game clip. He likely won’t be a big time scorer in the NHL but a career minor leaguer will absolutely work his tail off each and every night and it is possible that John Mitchell’s (the man who is most likely to be affected) Maple Leafs career is closer to coming to an abrupt end. Mitchell has shown some promise but seems to lack ‘jam’ or the extra gear that would allow him to be a consistent and productive pro in the NHL. It is possible he is one of the youngsters than Brian Burke and Ron Wilson refer to when they discuss the perceived ‘entitlement’ players sometimes feel because they play in a large market with constant attention from the media 24/7. KEEP IT TO YOURSELF KRIS! Among growing, disgusting and annoying trends, players who bite, chew and play with their mouthguards obsessively is something I could just as well go without! I thought when Marco Belinelli (Raptors former swingman) was sent packing we wouldn’t have to endure a high profile player with his mouthguard on display all game, until Kris Versteeg came to town. One game into a pre-season doesn’t mean a whole lot so I won’t focus on the final result of the game but rather give a few observation and musings from game one for the Toronto Maple Leafs versus the Ottawa Senators in game the Leafs lost 5-0 and were booed off the ice at the conclusion, you have got to love Toronto fans! -I know I have been harsh on him already after a relatively poor rookie tournament but Nazem Kadri appears to have taken a step back in terms of his speed and skating. I know his offseason was focused on adding much needed strength and muscle mass but I think it might have been at the expense of Kadri’s bread and butter speed, agility and quickness. Kadri appeared to be a boy amongst men tonight and didn’t show half the flash and dash that fans have come to expect from the junior hockey standout. He turned the puck over and was basically a non-factor throughout the night other than a nice move in the second period that drew a penalty after he beat the defensemen Matt Carkner and was hauled down. Kadri had ample time on the power play and really didn’t leave much of an impression one way or the other. My feeling is Kadri begins the year with the AHL’s Toronto Marlies, and hopefully Kadri uses that as motivation to improve himself with some hard work in a solid league for a Marlies team that promises to be an interesting and deep group. I do not think Kadri is operating at one hundred percent currently or he really has put on too much weight for his style of play but he hasn’t been himself at first glance. Mikael Grabovski is going to be our second line centre as I feel he is just a better option for the team at this point and has looked solid out of the gate. We gave up a 2nd round pick for Grabo and it’s time we see a return on that investment, this could be the breakout year Grabovski believers have been looking for since his time in Montreal. –Kris Versteeg had some solid moments in the hockey game, showing some solid speed and hands as he knifed his way into the offensive zone on a few rushes and had a lot of hustle on the night. He should be a solid if unspectacular performer for the season and could potentially be a 25 goal scorer if all things align correctly. –Colby Armstrong will be a fan favourite early and we finally have a player that can and will hit any and all players on the ice (including stars) which will force the opposing team to engage him in the aftermath of his handy work and hopefully in the process draw some opposing penalties. -Veterans Dion Phaneuf and Tomas Kaberle had horrendous games and made the 2009/10 Maple Leafs powerplay look impressive with a shoddy display of eratic shooting from the point. -Our best line on the night was easily Jay Rosehill/Christian Hanson/Mike Brown – all three looked strong on the forecheck and were throwing their weight around all night. Hanson and Brown were two players that looked particularly strong and will likely be joined by Colton Orr to form a solid checking/energy line during the season. Brown was a great addition for some much needed secondary toughness and he handled the bigger Simpson from the Senators in a spirited tussle. Christian Hanson has obviously worked hard on his game in the offseason as he also looked to be in strong form with a strong puck pursuit and physical edge, I think he proves to be a solid 4th line centre with the potential to move into a more prominent 3rd line checking line centre role if he continues to impress. Hanson is up to 230 pounds and kudos for the strong effort in the fight versus Brian Lee, easily winning the decision. –Marcel Mueller was basically invisible and Jerry D’Amigo didn’t get all that much ice time but showed flashes of speed when he did play, Brayden Irwin has big size but needs to make bigger strides to improve his skating if he intends to be a full time NHLer. –Matt Lashoff and Simon Gyspers didn’t look overly impressive on the blueline, while Brett Lebda had a couple promising moments and should add some depth on the blue line in case of injury. -Goaltending was shaky at times with Jonas Gustavsson outplaying rookie Jussi Rynnas with the latter giving up a couple shaky goals. With five games in five nights we will get a good look at a lot of different Maple Leafs, stay tuned for more updates, observations and musings! –Nazem Kadri didn’t look that hot, he never got into the flow of the game and tried to do to much at times. Most of my section was generally unimpressed with him not even hoping for highlite reel plays but to just play even an effective simple game with solid passing and positional play. It wasn’t his night as he didn’t win draws or make much of an impact outside a nice hit or two. **UPDATE: Nazem Kadri suffered a minor injury in last night’s game, which makes some sense to me given how he didn’t look like himself at all. His body is likely going through hell right now with his first real off-season dedicated to conditioning and weight lifting to add some much needed strength and size to survive the rigors of a full NHL season. Let him rest and come back strong for camp, this is a huge adjustment for him physically. –Sondre Olden looked unreal, flashing great speed and skill to go along with great size. He could be a keeper going forward, possible steal? –Jerry D’Amigo is still a ways off, no chance he cracks the Leafs roster this season, who’s spot would he realistically take? –Brayden Irwin looked improved, slightly better skating (could it get worse?) and he won nearly every draw he took. Still a long shot to ever play in the NHL though in a meaningful role, a possible 4th line centre? –Greg McKegg looked fundamentally sound (as advertised) but he has more flash and dash than I expected, definitely looks like a possible second liner scoring winger for the future. Could McKegg be a more effective pro than Kadri, that was the talk making the rounds with some excellent and knowledgeable fans. –Jussi Rynnas looked shaky at best in the first period but settled down after that and made a few good saves as the Leafs were outshot and outplayed. The Hawks goalie looked terrible all night and gave up a few questionable first period goals. –Korbinian Holzer had my entire section in awe, always in position and used his size and strength all night and was never beat one on one. Good debut, could be a solid 5-6 d’man. -Nobody from the Hawks wanted anything to do with tough guy Jamie Devane, he tried to get a couple things going with some opposing forwards, all for not. -Marcel Mueller looked impressive, he used his size and strength and big frame to his advantage. -No Mike Liambas tonight (player suspended from the OHL for hit in 2010) as he wasn’t dressed, there was a lot of discussion surrounding him and his reputation. F – Sam Carrick, 6’0″ – 188 AGE 18, Andrew Crescenzi, 6’4″ – 195 AGE 19, Jerry D’Amigo, 5’11” – 208 AGE 19, Jamie Devane, 6’5″ 217 AGE 19, Brayden Irwin, 6’5″ 215 AGE 23, Nazem Kadri 6’0″? – 188 AGE 19, Mike Liambas, 5’9″ – 204 AGE 21, Greg McKegg 6’0″ – 190 AGE 18, Dale Mitchell 5’9″ – 200 AGE 21. So I took in the Toronto Maple Leafs vs. the Chicago Blackhawks rookie squad tournament game tonight and I am going to make a bold prediction, there wasn’t one single Maple Leafs player that is a first line forward or top two defensemen playing tonight, Nazem Kadri included. Don’t get me wrong, Kadri is a fine hockey player and can add a lot to a team but I have never been that sold on him as a first line centre going forward and I think at best he is a poor man’s Scott Gomez, while at worst he could be run out of town by the brutal Toronto media. Kadri looked awful, he couldn’t win a faceoff, he went 1 on 3, he made bad passes and he looked anything but a promising dynamic offensive player. Now, it was only one game, and a rookie squad tournament game at that, but Kadri did not look good tonight and I think the jury is out on him league wide. What type of player can a smallish forward truly become in the NHL without the overall pedigree and skill set of say a Sidney Crosby, Zach Parise or Taylor Hall, players who have absolutely dominated at every level of hockey. The night started at a local pub outside the John Labatt Centre in London, Ontario – a great city and a great venue. I had noticed a large family sitting at a table near my wife and I while we were having a few drinks and I kept saying to her that the man (father) at the table looked familiar, when he left it hit me, Nazem Kadri’s father and family, pretty cool. When we got to the JLC who was sitting in the box basically right beside us? Brian Burke, Ron Wilson and the Maple Leafs brass – taking in the tournament and scouting out some future Maple Leafs Marlies prospects. I doubt they were too impressed and during the intermission there packed box was intently watching some college football (American colleges of course). The Leafs were soundly outplayed by the Blackhawks rookie squad and were it not for absolutely shabby goaltending from the Hawks tender the score would have been quite different in my opinion. Leafs goaltender (and future Marlies goalie) Jussi Rynnas looked shaky in the first period but settled down and overall played a pretty solid game. Other players who made a strong impression in my eyes were forwards Greg McKegg (62nd overall pick in the latest draft), Bradley Ross (43rd overall) as well as defensemen Jesse Blacker and hulking European Korbinian Holzer who never looked out of place and played a strong two-game game. Brayden Irwin hardly lost a faceoff and played a solid two-way game but the Leafs player I was most impressed with was easily Norwegian forward Sondre Olden. Olden, drafted 79th overall in 2010 showed unbelievable speed and skill and was easily the best Leafs forward all night with his consistent effort and drive in all situations on the ice. Invisible or ineffective were Jerry D’Amigo (awful passing and turnovers, very ineffective) and the aformentioned Nazem Kadri while Marcel Mueller looked to be a man playing against boys as he flashed great strength, size and puck control on more than a few occasions, definitely promising. As I looked at the Leafs press box and saw Brian Burke (who killed at least 4 coffees) I couldn’t help but think that he wished Tyler Seguin was in camp and trying to impress the Leafs brass as opposed to this relatively lacklustre group that is likely filled with future Marlies and maybe less than a handful of future Leafs (role) players. I know we all love Phil Kessel but seeing what rookies are currently in the system is a bit depressing and if they were ranked league wide the Leafs would definitely be in the bottom half (or quarter) of the league in terms of young talent in the pipeline, without a doubt. Luckily our major league roster is actually somewhat filled with solid talent (25 years and younger) because the stream of talent from our drafts and minor league system looks pretty bare and with no first round picks coming from last draft or the upcoming draft it isn’t likely to improve much from here. Please don’t take this as a doom and gloom piece, we are finally building up some much needed depth and there is definitely talent within our system, but it is obviously lacking (according to most respected league sources) in any top end dynamic talent outside of hopefully Nazem Kadri, but Kadri is undersized and unproven and I hope in six months I am eating my words but for now I remain sceptical. Tags: Adam Wainwright, Albert Pujols, Albert Pujols triple crown, Diamond Mind Baseball, DMB, DMB 2010, DMB Baseball, DMB most valuable players, DMB simulation league, Evan Longoria, Hanley Ramirez, Hanley Ramirez down season 2010, JJ, Joe Mauer, Josh Johnson, Miggy, Miguel Cabrera, Murderer's Row Plus Cano, Robinson Cano, Roy Halladay, Roy Halladay Toronto, Ryan Zimmerman, Ryan Zimmerman underrated, tdotsports, Top 50 DMB trade values, Top DMB players, Top Ten DMB Baseball Players, Top Ten MLB Baseball PLayers, Toronto sports, Toronto Sports Blog, what is xFIP? So here we are, to our Top Ten DMB Ball Players and I must say looking at the top 15-20 there isn’t much that seperates most of these players, almost personal preference or just slight improvement in key areas (and age). It has been awesome to break this type of list down with a “DMB” twist and I look forward to doing it every season. We’ll see who rises and falls the most season over season and see what hot new players burst onto the scene in 2011, hope you enjoyed. Quick Take: Definitely one of the best arms in baseball, sporting a solid 8.2 K/9, 2.3 BB/9, 2.91 FIP and a solid gb rate Wainwright is quickly becoming a reliable workhorse and ace pitcher many had envisioned when he was a prospect. His big weakness in 2009 was his propensity to get slightly roughed up by left handed hitters appears to be over given his .222 avg vs L this season and he should be counted upon to be one of the game’s best starters for the next 5-6 seasons. DMB CON: lefties have historically hit him relatively hard, not a major concern at this point. Quick Take: Can you believe this is Cano’s 6th season with the Yankees? 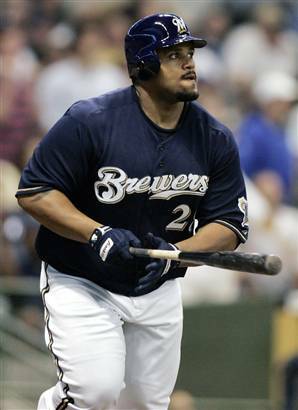 It feels like just yesterday he was the young rookie from “Murderer’s row plus Cano” but now he is firmly entrenched in his prime and his offensive game has gone to unseen heights, his power (.238 ISO, .563 SLG%) as well as patience (8.5 BB%, almost double is career rate) has powered the second basemen to a career best .402 wOBA. Cano plays a very valuable position and has improved his defense in 2010 (3.2 UZR) and is the best overall second basemen in the game on pace for 30 HRs. He has finally put it all together in 2010 and should remain among the best middle infield options in DMB for 4-5 seasons if he continues to improve his patience and plate discipline. DMB PRO: huge power for a 2B, big numbers versus lefties and righties. DMB CON: plays in hitter’s park, still needs to improve BB rate to maximize DMB value. Quick Take: One of the top overall arms in baseball, Johnson has taken another step forward in 2010 posting career best numbers in ERA (2.28), K/9 (8.8), BB/9 (2.28), FIP (2.50 and xFIP (3.23) in his second full season in the majors since coming back from TJ surgery. He is equally effective against lefties and righties and possesses one of the biggest fastballs in the game (94.8 MPH) and has shown a solid gb rate in his career. The only flaw he has DMB wise is pitching at Marlins Stadium, a notorious pitchers park. Quick Take: Having an “off-year” with only a .420 wOBA, Pujols is in contention for the NL Triple Crown and is again having a remarkable season, if you don’t compare to his past body of work of course. One of the best hitter’s of our generation, Pujols is likely to be among the game’s best all around players until he retires. DMB CON: only a 1B. Quick Take: Probably the game’s best right handed hitter, if he was still rated at 3B he would probably be near the top of this list but as it is he is still firmly in the top ten as his offensive ability carries him a long way. Miggy possesses huge power (.305 ISO), patience (14.4 BB %, .437 OBP) and a huge .446 wOBA all while playing in a pitcher’s park with zero protection is a pretty lame Tigers lineup. Equally amazing against lefties (1.034 OPS) and righties (1.096 OPS) Cabrera is entering his prime and there is no reason to believe he won’t remain among the game’s best hitters for the next 5-6 seasons. Quick Take: The best pitcher in baseball, period. Halladay is a nightmare matchup for any hitter with his impeccable control over an arsenal vast enough to make an army general jealous. Halladay throws a nasty two-seam fastball with good sink, a cutter he throws to both lefties and righties, a solid overhand curveball and an improving changeup he hasn’t thrown with much frequency until 2010 – scary. The only thing keeping him from being ranked even higher is his age, though showing no signs of slowing down in 2010 (career best ERA at 2.27, FIP 2.80 and xFIP 2.91) Halladay has carved up the NL after serving as the game’s best pitcher in the game’s best division (AL East) since 2002. Doc seems to have a skill set that will age well (a control, groundball pitcher) that a Greg Maddux like age 36-40 period doesn’t seem far-fetched. DMB CON: aging – like fine wine however. Quick Take: One of the best all around players in the major leagues, his big time power (career .240 ISO, .523 SLG%), decent patience (10.2 BB %) and outstanding defensive abilities (15.3, 17.7 and 8.4 UZR marks the past three seasons). Still young and theoretically improving Longoria will be a DMB mainstay on rosters for the next ten seasons with his huge level of talent. Hits lefties and righties nearly equally as well and has added a bit of speed in 2010 (15 SBs) to go along with the power. Quick Take: The player to which all prospective catchers will be compared to for the next 15-20 seasons, maybe longer. Mauer has everything you want in a DMB player, he plays the most demanding (and leanest) position at catcher, has solid power for a backstop (.156 ISO), patience (11.7 BB %, 11.0 K %) and average (career .327). The fluky power show from 2009 (in 2009, his HR/FB was 20.4 %, his career mark is 10.7 %) hasn’t returned but when you have a catcher that is as strong of an overall hitter and player as Mauer you have one of the top assets in DMB baseball. Only 27 years old and entering his prime, keep an eye on the park factors for the new Minnesota ballpark. DMB CON: power has come and gone over his career. Quick Take: Simply, Zimmerman is a beast. Playing in a pitcher’s park Zimmerman has put up huge power numbers (career .199 ISO), his 12.3 BB % is a career high which has also led to a career best OBP of .387, Zimmerman has it all. One of the best defensive players in baseball at a relatively thin 3B position, there aren’t many better all around players in the game when factoring in age, talent and what DMB values in a player. Zimmerman might still improve as he is only 26 years old and the future is bright for a guy who has already put up a 6.3 WAR in 2010. Quick Take: Like we discussed with Pujols previously, Hanley is having a bit of a ‘down’ year but has still put up an impressive .370 wOBA with a triple slash line of 299/375/476 in 2010 while providing league average defense at shortstop, he is miles better than any other SS in DMB considering he also plays in a pitcher’s park. He destroys righties (874 OPS in 2010, 1018 in 2009) and has been remarkably consistent with his offensive numbers (.364, .411, .405, .410, .370 wOBA ) since his rookie season. Hanley brings everything to the table, average, power, patience, speed and improved defense. At only 27 years old, Hanley will be entering his prime hitting seasons and is poised to be considered one of the best hitting shortstops in the history of the game if he continues at his current torrid pace.